Wednesday Family Nights start on 9/13 with a new time this year! All activities will be held 6-7:30pm. Activities include ROOTED for Kids Preschool-5th grade, Middle and High School Student Ministry, and Adult Small Groups. See you there! ​If you're new to our church in the last few months and you haven't been to a pizza lunch yet, we invite you to join us! 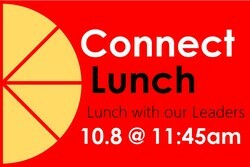 Join our pastors, staff, and their families for informal conversation and a pizza lunch. Reserve your spot here. Click here to view upcoming Student events!